Excavation, an activity that causes the deaths of two workers every month, is one of the most hazardous construction operations you might undertake this spring. 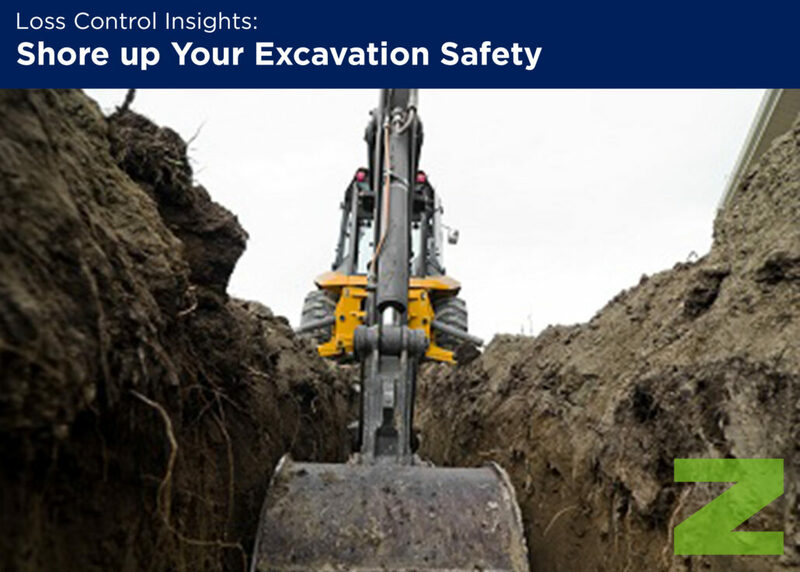 There are a lot of factors that affect safety during excavation, so we asked our experts for the number one thing you should be doing (but probably aren’t). Their answer? The easiest and most effective way to improve excavation safety is to designate a competent person for your excavation operations. Several OSHA standards, including those governing outdoor scaffolding systems, reference the need for a “competent person.” But many people in the construction field aren’t aware that it’s a requirement for excavation and trenching. It doesn’t matter if you’re digging a 1-foot trench or a 20-foot hole; if you’re excavating, you need to have a designated competent person. Hazard Recognition – a competent person can identify existing and predictable hazards in the surroundings or working conditions that might be dangerous to employees. Task-Specific Knowledge – a competent person understands soil types and protective systems. Able to Stop Work – a competent person is authorized to protect employees by stopping work until a hazard or dangerous condition can be corrected. When asked to identify their competent person, many contractors can come up with the name of someone on their crew who is pretty close. Someone who probably has some experience with excavation and may be able to answer a question or two about it. But that’s just not enough. To be fully in compliance with OSHA (and to fully protect your employees), you need to identify someone by name who meets the competent person criteria outlined above. Depending on the size of your operations, you may actually want to designate more than one. List the names of your competent people in your safety programs and materials to make sure everyone is on the same page. What Does a Competent Person Do? A competent person is responsible for overseeing your excavation operations. That doesn’t mean they need to be on-site for the entirety of an excavation, however they should inspect excavations daily and whenever conditions change. These inspections should occur before worker entry to ensure all hazards have been eliminated. It’s a good idea to document these daily inspections to show you are in compliance with the standard. Try using our free Excavation Inspection form to guide the inspection, then retain the completed copy for future reference. What is the Process for Becoming a Competent Person? Becoming a competent person is actually much easier than many people assume. It’s not an official certification and there’s no standardized test that must be passed to attain the status. The requirements are less formal. To qualify as a competent person you need to have a solid understanding of the different methods of digging, types of soil and kinds of protection systems available. If you understand how those factors interact—if you can visualize them, explain them, and demonstrate knowledge about them—then you are likely a competent person. There’s no single path to follow to become a competent person. Experience is the most common way people get there, especially if they have worked in the trade for many years. Someone who is newer to the industry might need more training time, though probably not as much time as you might think. While you certainly could take a multi-day course on the subject, many people do just as well using self-study materials that are easily available online. Here are a few to get you started. OSHA’s Trenching and Excavation Topic – Get familiar with the standard and what it requires. This site also includes construction-specific technical resources and examples of hazards and solutions. What Else Can I do to Make Excavation Safer? Beyond daily inspections and regular monitoring, there are several things a competent person can do to increase excavation safety. Plan Ahead – A great best practice (one that is sometimes enforced by general contractors or owners) is putting together a pre-dig permit (sometimes called a “daily dig permit”) before any excavation begins. Before you start digging, put a plan down on paper that identifies what equipment will be used, how deep you plan to dig, what soil type or water conditions are present in the area, etc. By thinking through the tasks in advance, you can spot problems before they occur. Even if this isn’t required on your job, creating pre-dig permits will set you apart as an organized, safe contractor who knows how to plan ahead. Find the Best Solution – Sometimes it can feel like the goals of the competent person run counter to the goals of the installers. The site personnel may claim the trench box is in the way, or perhaps the project is running behind and there is concern about how long it will take to shore appropriately. While benching and sloping is a common do-it-all solution, it doesn’t necessarily work well for everything. Luckily, technology and products have come a long way, and a little time spent researching before you start the job can help you find a mutually-acceptable solution. Don’t be afraid to ask for input from your equipment rental company. They can offer helpful recommendations when you’re trying to select the best protective support system for the job. Communicate Frequently – An effective competent person will have the familiarity and availability to talk with the employees performing the work. Encourage open communication, even informally, about near-misses. Fixing the problem that caused a close call could absolutely save a life down the road. As part of your regular communication, make sure employees are reporting issues with protective systems so they can be reported to the equipment rental company and fixed as soon as possible.